AKROPOL Remodeling and Interior Design, in Matawan, New Jersey, specified our Louis XIV decorative grilles throughout their clients’ New Jersey home. They wanted their client’s order as quickly as possible in a white paint grade finish which was going to be custom painted. Our Rubbed Bronze finish can be done in the most timely fashion. Since they were going to paint them anyway they agreed to have them made in Rubbed Bronze. 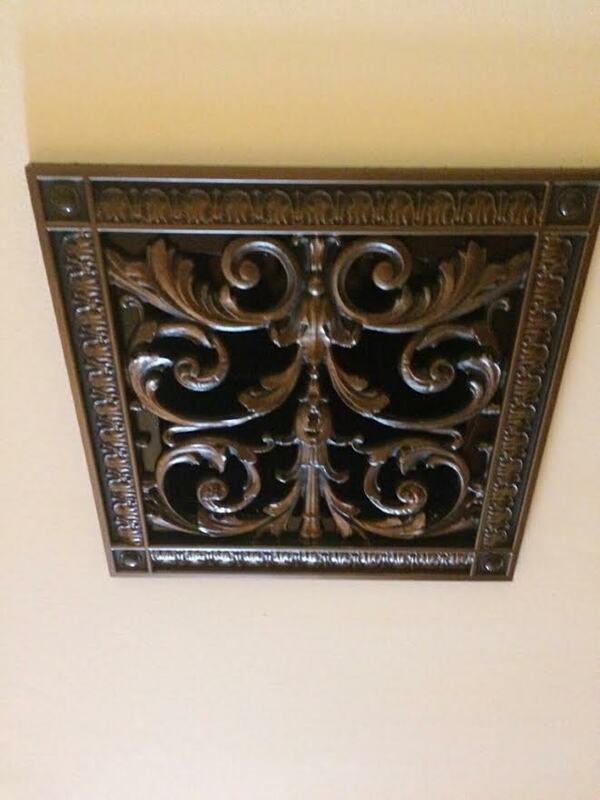 When they received the grilles they loved the Rubbed Bronze and decided to keep the finish! Very clever installation used 2 Louis XIV 16″ x 16″ grilles $189. Our Victorian style decorative recessed light Trims were brought from their clients’ former home. They also needed dampers for many of the decorative grilles. We do offer opposed blade dampers when controlling air flow is required. A screwdriver controls the blades. Levers protruding from the damper would not work with the decorative carvings of our grilles.